We crossed the Bosphorous today, the bridge is regarded as the link where Europe meets Asia, and we have arrived a most comfortable hotel overlooking a blue sea at Silivri. Every day brings us nearer to Paris and the fact that we are now in Europe brings home the remarkable effort that each and every crew has had to put in to get this far. It has proved an easy run for most, and crews have spent the afternoon fettling cars and catching up on the laundry. Even Tim Scott made light work of today, riding his FN motorcycle. David Ingleby spent the afternoon at work in the sunshine soldering up bits of the 1914 electrics. Craig and Nicky Marshall in Car 69, in their Dodge Coupe, are nursing a cracked piston, having experienced a remarkable engine overhaul by a local garage owner who was able to replace a bent valve – fortunately they were carrying a spare – while entertaining the couple in their home… without a word of English being spoken. We have now had a chance to talk to Dave and Karen Ayre and more details have emerged on their accident the other day when the 1907 Itala spun on a wet road, damaging the front axle and bending the steering rods. No wheel came off and the car was repaired with the help of the Japanese television crew accompanying the event. The car is now back in the event. Gerry Crown, relaxing in the hotel’s coffee-shop, is feeling pleased with the progress of his Holden, he took a relaxed view of the testing Time Trials which have been organised with the help of Turkey’s national motor-sport Federation. With a commanding lead and everything to lose in the Classic division, he decided on a softly-softly tactic and stroked the big Holden round the mountains content that the risk-taking was now over. 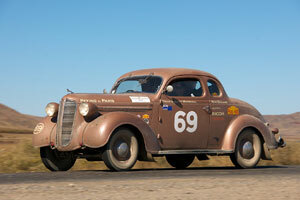 Interestingly, all three of yesterday’s Time Trials were dominated by cars in the pre-1941 Vintageant Category. 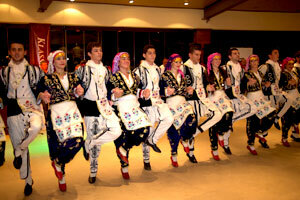 To mark our final day in Turkey we have been entertained at a cocktail party organised by the Turkish Classic Automobile Club.